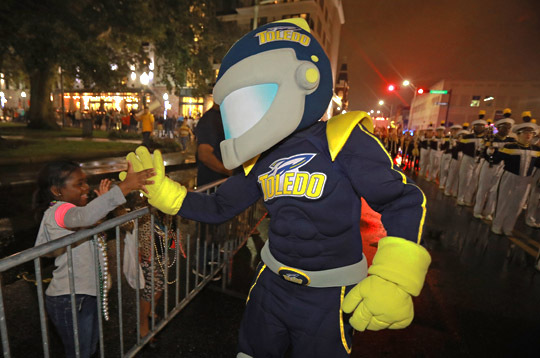 On the eve of the 2017 Dollar General Bowl, the Toledo Rockets had a full day of activities in Mobile Friday. Rocky gave a high-five during the Mardis Gras Parade Dec. 22 in Mobile, Ala.
After a morning practice, the entire team attended the mayor’s luncheon at the Mobile Convention Center. UT President Sharon Gaber spoke on behalf of the University. Former Oklahoma head football coach Bob Stoops was the featured speaker. 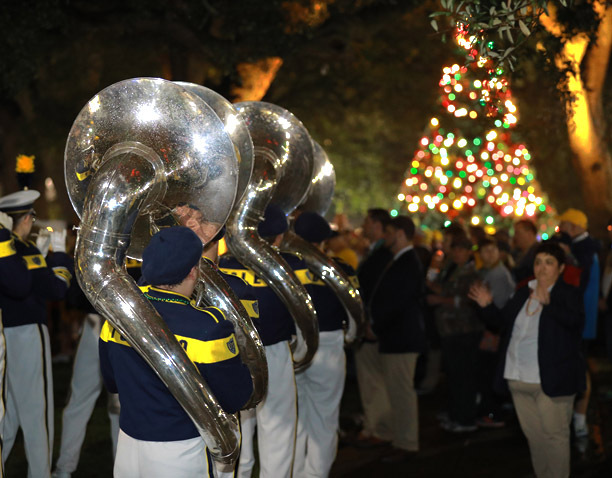 In the evening, some of the players attended the Mardi Gras Parade in downtown Mobile. Participating in the parade were the UT Marching Band, as well as President Gaber, the cheerleaders, and Rocky and Rocksy. The Rockets will battle Appalachian State Saturday, Dec. 23, at Mobile’s Ladd-Peebles Stadium at 7 Eastern time on ESPN. The UT Marching Band stepped it up in the Mardis Gras Parade. This entry was posted on Saturday, December 23rd, 2017 at 4:26 pm and is filed under Athletics, Events, News .